Here’s a great party idea! 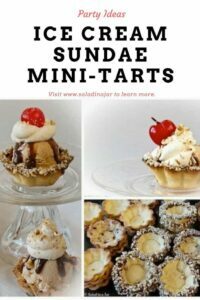 Try serving an Ice Cream Sundae Mini-Tart Party Bar. 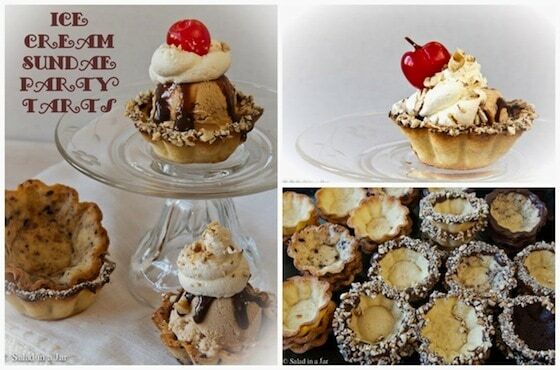 Serve ice cream sundaes in fancy but simply embellished homemade mini-tart shells. Let guests pick their shell and their ice cream. What Mae said. That is pretty much my philosophy about dessert. Actually, I just love having choices, and evidently, other people like choices too, Have you noticed the way ice cream shops like to advertise the number of flavors they offer? Before Thanksgiving, I helped host a wedding shower along with several other girls from my church. We wanted something different from the usual cake and punch routine. 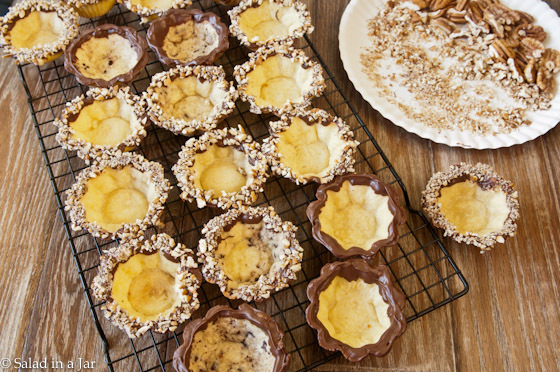 I decided to embellish individual vanilla and chocolate cookie-crust tarts (make them yourself or buy at most large grocery stores) with chocolate, nuts, and coconut and use them as the base for miniature hot fudge sundaes. I dipped many of the vanilla shells in chocolate, then chopped nuts or coconut. We offered three kinds of homemade ice cream along with the usual toppings– hot fudge sauce, whipped cream, nuts, and cherries. To hold the ice cream, I lined a large but shallow basked with plastic. We needed to keep it cold for about an hour as the shower was a come-and-go affair. A couple containers of ice cream were on reserve in the freezer when the ice cream in the basket began to get too soft. Notice the printed labels for the ice cream which made it easier for the guests to decide which flavor they wanted. We had homemade vanilla bean, homemade peanut butter, and blackberry with chocolate shards. I also had coffee ice cream from Starbucks (one of my favorites) in reserve. In reality, you don’t need a lot of ice cream because the tart shells don’t hold that much. 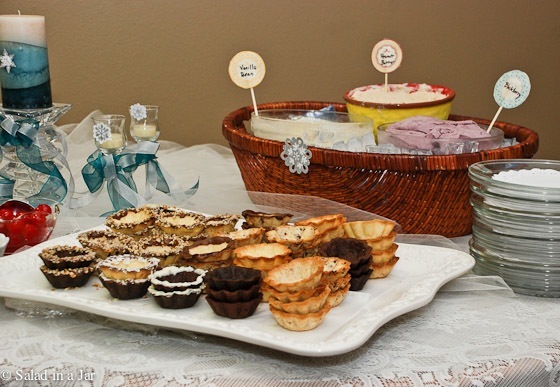 How creative you are Paula, and what a fun party, wish I could have been there to see all these delicious looking treats! You and your fabulous tarts! This is such a cute idea for a wedding shower–so cute and dress-friendly since they’re so proportional! I am so impressed that you even made homemade ice cream to make the sundaes. I’m pinning this to keep this in mind for future entertaining! What a sweet looking couple Tabitha and her fiance make. 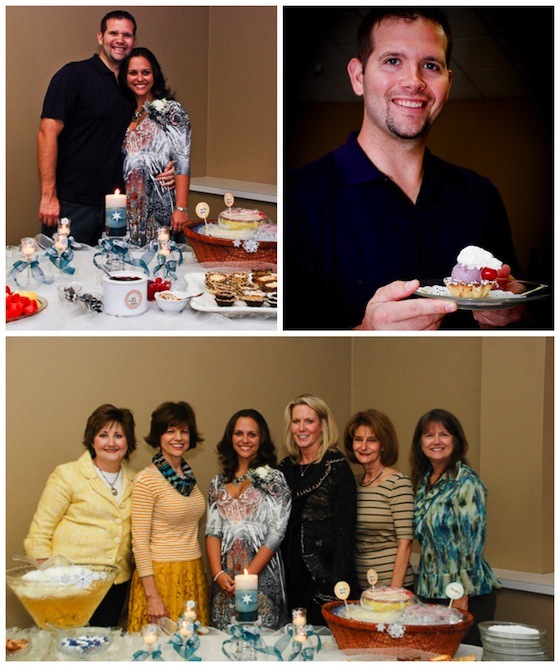 Your ice cream sundae mini tarts must have been the hit of this special shower for the happy couple. They tasted as good as they looked! Thanks Paula for being so creative for our group. Love the shells and the table is so pretty!